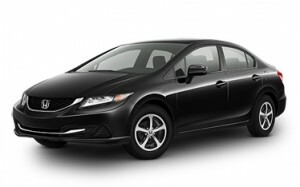 The 2015 Honda Civic is here at Central Illinois Honda Dealers, and we can’t wait to put you behind the wheel. But you might be asking yourself “is it really that different from the 2014 Civic?” After all, the 2014 model was incredibly popular, and changing away from that isn’t something Honda is likely to do. What we found is that Honda brought back much of what drivers loved about the Civic and then gave us an extra trim level. The Pilot isn’t the only vehicle receiving a Special Edition trim this year; the Civic gets one too. While you may have picked up what the LX, EX, and EX-L models had in 2014, we thought we could use a refresh with the new SE trim thrown in as well. LX: The entry-level trim is still top notch, featuring Bluetooth, a touchscreen infotainment system, a rearview camera, Pandora internet radio, SMS texting, and so much more. SE: The brand new Special Edition trim features Honda’s CVT as standard, adding on 15-inch alloy wheels, automatic climate control, Honda LaneWatch, and a rearview camera with dynamic guidelines. EX: Replacing and updating features found on the SE, the EX gives you push-button start, 16-inch alloy wheels, a one-touch power moonroof, smart entry, and multi-reflector halogen headlights. EX-L: The high-end trim comes with leather seating, a leather-wrapped steering wheel, 17-inch alloy wheels, an eight-way power-adjustable driver’s seat, and more. And if you’re driving the Civic LX or SE with CVT, you can earn an EPA-estimated 39 mpg on the highway. * Well-equipped and fuel efficient; it’s tough to get better than that. We think that there are very few drivers for whom the 2015 Honda Civic wouldn’t be a great fit, but the only way you can know if it’s the right one for you is to take it for a test drive. Contact a Central Illinois Honda Dealer near you and let us schedule your time behind the wheel.